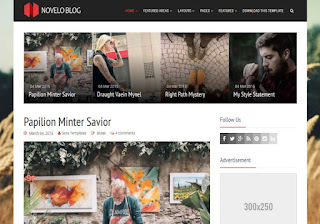 Novelo Blog Blogger Template is a responsive blogger theme with clean and minimal design, a perfect solution for those, who’s looking for a great theme to share their stories through the effective blogging site. Developed with SEO in mind, it includes a lot of custom options like social icons, buttons, great widgets and much more. It will help to showcase the content and set the website apart with its professional functionality and fast operating speed. Novelo Blog blogger theme focuses on its beautiful simplicity and comfortable user interface, that provides perfect functioning and easy customization.